In a recent post, we highlighted a chart from Crescat Capital’s second quarter letter to investors showing China’s unsustainable corporate debt growth. 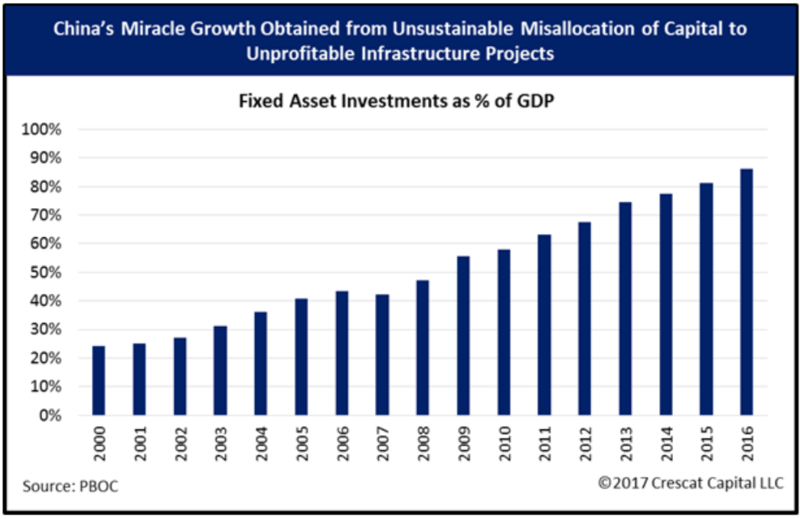 Today, we bring you another jaw dropping chart from the same letter that shows the enormous and unsustainable growth in Chinese fixed capital investment since 2000. Fixed capital investment is spending on physical assets such as infrastructure, buildings, property, machinery, or technology. While a certain amount of fixed capital investment is unquestionably good for any economy, fixed capital investment in China has reached completely unsustainable levels. It is largely responsible for the surging corporate indebtedness problem in China that we discussed in the previous post. It is also this excessive fixed capital spending, which is creating the illusion of rapid economic growth and high employment in China. An economy cannot be perpetually construction and infrastructure led. Eventually the things that are built most produce greater value than the cost to continue building more things. Anything short of that is unsustainable. When fixed capital spending rises relative to the size of an economy every year for decades, now approaching nearly 90% of all Chinese GDP, something is clearly wrong. With overcapacity already plaguing many Chinese industries, the problem is all the more acute. If they have a debt Jubilee What have they lost? The sucked resources, metal, concrete,into their country and have homes(many are empty), manufacturing equipment ect. They also have alot of precious metal. They could do a debt reset launch a new currency and be fine. Banks create money when they issue loans. If you have a house and farm you bought with loans and there is a reset that is great for you if the government says everyone can keep the house they live in. The eye at the top of the pyramid gets poked out.